It’s the that time of year where we all get the itch to press restart. You know, the second attempt after the new year (no judgment here!). 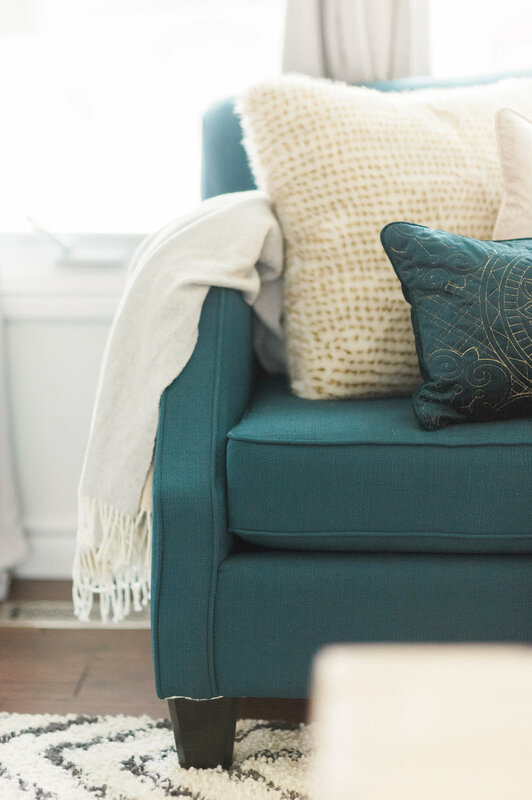 With organization and decluttering on our minds (thanks to the lovely Marie Kondo), I thought what better time to share my tips for ways to refresh and renew your home for spring! The first thing I do when getting my home spring ready is swap out all the winter themed scents. The apple pie and bonfire candles get stored away for next year, and out come the floral and fresh linen scents that make us feel like warm weather is near. This year, I’m trying something new and opting out of using candles. Instead I’m using high quality diffusers. My absolute favourite - West Coast by Vancouver Candle Co.
Add some greenery! Did you know some indoor house plants can actually improve the air quality in your home? Plants like the split leaf Monstera (philodendron family) actually do more than just look pretty. They are always working to actually detoxify the air in your home. One of my favourite parts about getting my home spring ready is stripping all the linens, slip covers, and curtains, and taking them for dry cleaning. It’s like jumping into fresh hotel bed sheets the first night you check in. I mean, is there anything more satisfying? I’m a firm believer that everything needs to have a place in your home. It keeps not only your home tidy and organized but also helps to keep your mind clear too. I didn’t realize until moving that I had A LOT of stuff. I was definitely guilty of the “one day I’ll use it” saying. Since then, I make it a habit to go through our things every season and donate, toss, or recycle any items we are not using. The best method I have found for this is taking everything out of its spot and going through the items one by one. Deciding what you use most and what has really just been collecting dust. Whether it be the kitchen cabinets, your makeup drawer, or your closet. When going through your makeup and toiletries, keep in mind expiry dates, brushes and tools that are worn out, as well as products you may not have liked but have been holding on to. For clothing, part with items that are ill-fitting and/or worn out, in addition to items you never seem to wear. Once you have decluttered, the fun really begins. But before you go out and buy a ton of dividers and containers, measure your spaces first! Measure drawer openings and cupboard heights to make sure you maximize your storage potential. My favourite places to shop for storage solutions are Ikea, the dollar store, Home Sense, and Amazon. For food storage solutions, Williams Food Equipment and Gourmet Warehouse. I always jump at any excuse to throw a party for my girlfriends and this Valentine’s Day is no exception. I gathered all the sweets, all pink & red décor I could find, and whipped up some super easy appetizers that are sure to be crowd pleasers. I am sharing these quick Mediterranean style recipes with you, plus some tips on putting together your own Galentine’s Day party! Décor for a themed party is key. Luckily, Valentines Day is all about the sweets and pink hues when it comes to decor which makes things super fun and simple to put together. For this party’s table top décor, I started off with a pink and gold table cloth I picked up at Home Sense. However, you could totally use any pink hue or neutral for the table cloth as it will mainly act as your base. Then you can play around with colour in other aspects like the charger plates and accent pieces. Before I decided on good old pink, I was actually playing around with a pale blue colour that was to die for! For the serving pieces, I used some old small vases I had on hand to store the pink and red candy I had grabbed from Bulk Barn, as well as the odd ice cream bowl to hold additional candy. What I like to keep in mind while setting the spread for the table is “layers”. I love to create a 3 dimensional look using different heights of serving ware. To continue with this method, I also added a small cake stand for the cookies and left the remaining appetizers to be on flat plates, lowest on the table. Next, I added some fun Valentine’s craft supplies I had lying around which included some red, pink and white pompoms (just from the dollar store), heart shaped balloons from Canadian small business Joonie + Joe, as well as the “BE MINE” mini banner that I found at Home Sense. I love using these items to fill in the empty spaces on the table between the serving ware to give it that overflowing look. Lastly, I finished by adding my charger plates, dinner plates, napkins, cutlery, and glassware. This part is pretty standard, but I want to add that you shouldn’t stress if you don’t have any Valentine’s serving ware. I didn’t either! I used basic off white charger plates and some gold accented napkins that I thought matched the table nicely. Where you can tie in the Valentine’s theme is what you decide to use for the plated favours. I decided on note cards, but you could always use name cards or mini candy favours or anything else you can dream up. The options are truly endless. 1. Begin by boiling the chickpeas in a pot of water for 45min. Once they are finished boiling, strain the chickpeas and rinse. As you are rinsing the chickpeas, massage them with your fingers to help break the skins away from the peas. Removing these skins will help to make the finished hummus extra smooth. Once you have rinsed the chickpeas, fill the pot with water just enough so the skins float to the top. This makes the removal much easier. 2. Next, transfer the chickpeas to a food processor with the blade attachment in place. Add the remaining ingredients to the food processor and blend until smooth. If you are adding garlic, you will need to crush the garlic before adding it to the processor. 3. Time to plate! The great thing about hummus is how versatile it is. You can go the traditional route by topping it with olive oil and garnishing with a small amount of paprika or get creative with it! 1. Begin by slicing the tomatoes and bocconcini about ¾ cm in thickness, then the baguette about 1cm in thickness. Cut the bread on a slight angle to create more elongated pieces. 2. Layout the bread on a plate, then, place the slices of bocconcini and tomatoes on top in that order. One piece of each per slice of bread. Next, sprinkle a pinch of salt and pepper over the tomatoes and place a basil leaf on top of each. 3. Once you are ready to serve, drizzle olive oil across the leaves and your done! Take a small bowl and combine the zaatar and olive oil to make a smooth paste like consistency. Then, take your pitas and spread enough zaatar to cover the centre, leaving a thin crust around the edges. Add the finished pitas to a baking sheet and bake for 7-10 minutes or until they just start to brown. Enjoy these pitas with chopped cucumbers and tomatoes, or use them alongside hummus dip! I hope you found this guide to throwing your own Valentine’s Day party helpful! I would love to hear any party tips or recipes you swear by. Let me know in the comments below :). Spending Valentine’s Day in this year? Get cozy and treat your special someone to a decadent dessert that is both simple and delicious. The bonus? This recipe can be prepped in advance for those with a busy schedule (my favourite part)! Preheat your oven to 350 degrees. In a small bowl, combine flour and salt. In a stand mixer, beat the butter at medium-high speed until fluffy, 3 to 5 minutes. Once fluffy, add the sugar and beat until combined. Next, add the flour and salt to the butter mixture and mix on low speed just until combined. With the remaining butter, evenly coat the tart shells to prevent the dough from sticking. 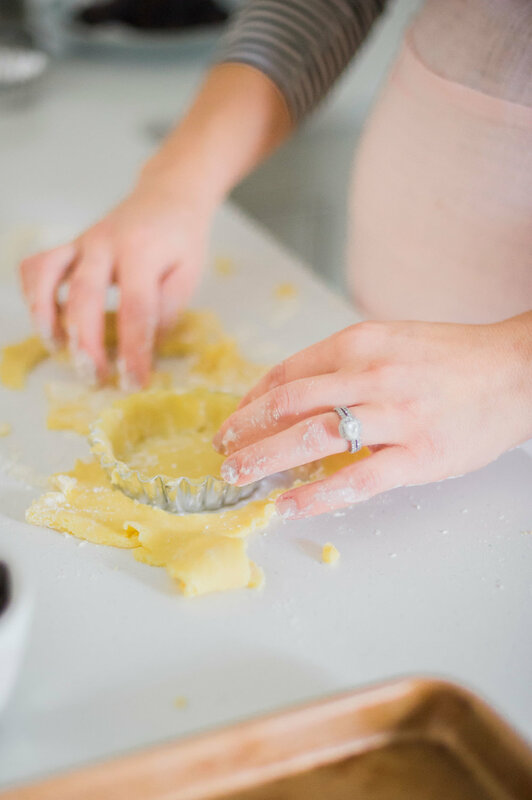 Once finished, roll out the dough on a floured surface to a one centimetre thickness and press evenly into the shells. Refrigerate until firm, about 20 minutes. Remove the tart shells from the fridge and place enough pie weights in each to cover the bottom. This will keep the dough from rising in the middle while baking. Add the tart shells to a baking tray and bake for 15 minutes or until golden and firm. Once baked, immediately place them on a cooling rack. When they have cooled enough, remove the weights and cookies from the shells. Set aside. To make the ganache, melt butter in a sauce pan over low heat. Once melted, add the chocolate and mix until melted. Be sure to mix constantly so they chocolate does not burn. Next add the heavy cream and stir until it is completely combined and there are no lumps. After the ganache is complete, pour a layer into each tart (enough to generously cover the bottom). Spread it evenly with the back of a spoon if needed. Finally the fun part! 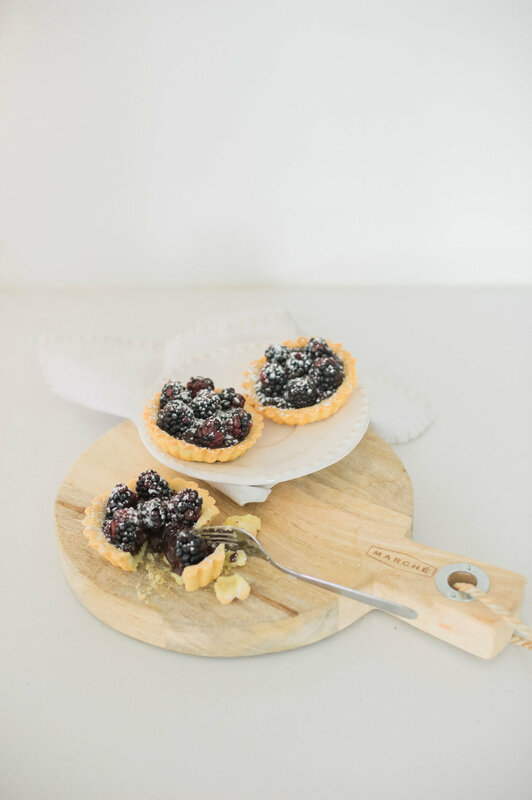 Add a layer of berries to the top of the tart and sprinkle confectioners sugar to decorate. 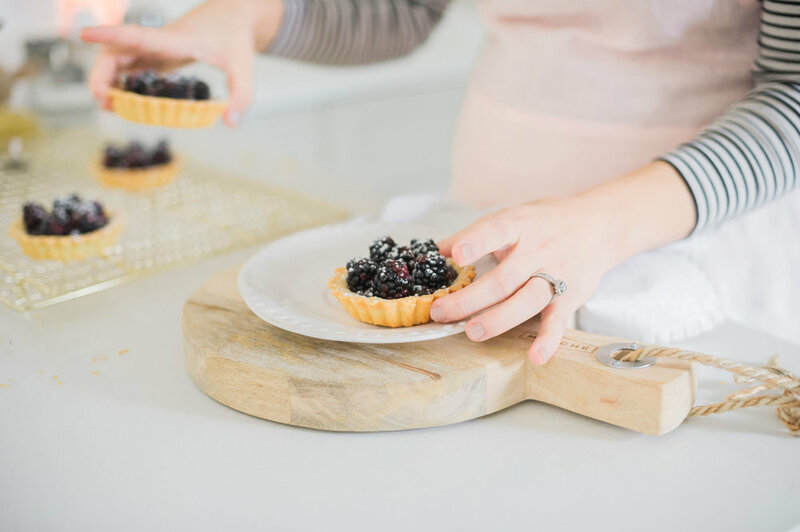 Be sure the berries are completely dry from washing before adding them to the tart. There you have it! A super simple but decadent dessert to serve this Valentine’s Day, or any special occasion! This winter season has definitely taken its toll on my skin. So since one of my 2019 new years resolutions is to practice more self care, I thought what better way to get started than to whip up a batch of some super moisturizing soap. If your skin is begging for some hydration, you need to try this super easy and quick recipe below. To begin, dice up the soap base into cubes and place them in a medium microwave safe bowl. This will help it melt quicker and more evenly. Once diced, place the bowl of cubes into the microwave, heating it in 1 minute intervals until melted. About 2.5 minutes. 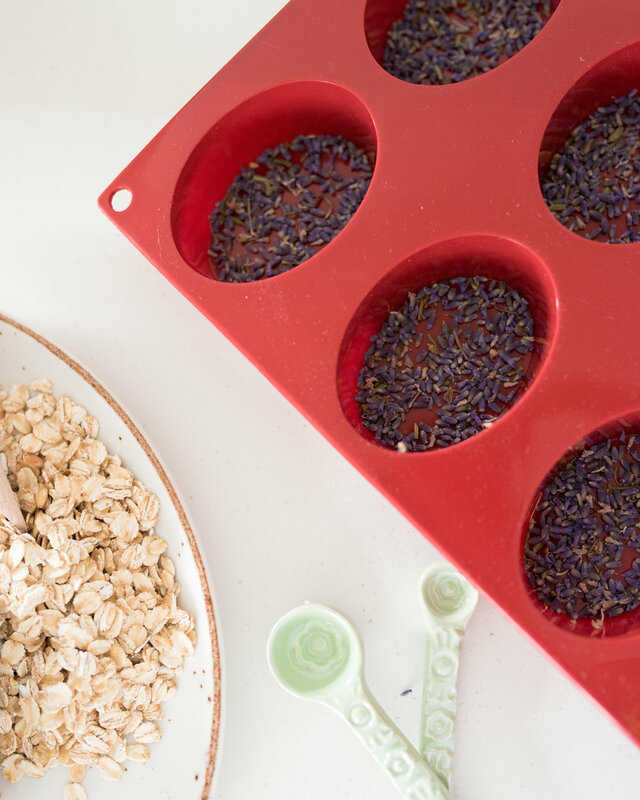 While the soap base is melting, place a pinch of lavender buds into the bottom of each soap mold. This will give you a nice layer of lavender buds at the top of the soap bar once it is complete. Next, add in the oatmeal and essential oil to the soap base and mix it. Finally, transfer the mixture to the soap molds. To do so, grab a large liquid measuring cup and transfer your mixture to it. It will make it much easier to pour your mixture into the molds from the measuring cup vs straight from the mixing bowl. Pour up to the top of each mold then set aside to cool (approx. 2 hours). Once the soap bars have solidified, you can store them in a cool, dry place, separated with wax paper to prevent them from sticking to each other. If you decide to gift your soap bars, the style you package them in is endless! For these soaps, I used craft tissue paper and thick twine to give them a rustic look. I tore the tissue paper instead of cutting it to help add to that effect. I hope you enjoyed this DIY soap recipe. I could not believe how easy and quick it was to make! I am already thinking of what other scent combinations I will do next! I absolutely love Gingerbread Cookies around this time of year. They bring up nostalgic memories as soon as you take your first bite. My own memory was growing up in my parents’ bakery, constantly stealing the smartie buttons and then quickly hiding away to enjoy them before anyone noticed! Looking back, I’m sure they were on to me. It was one of many great memories from my childhood that I can’t help but celebrate every holiday season, and It makes me so happy to be sharing my recipe with you. In a medium bowl, whisk together flour, baking soda, salt, cinnamon, ground ginger, and ground nutmeg; set aside. With an electric mixer on medium speed, beat the butter and brown sugar until well combined and smooth. Add in your molasses and egg. Preheat the oven to 350 degrees F. Then divide your dough into two pieces. This way one is continuing to chill while you work with the other. The firmer the dough, the easier it will be to work with. 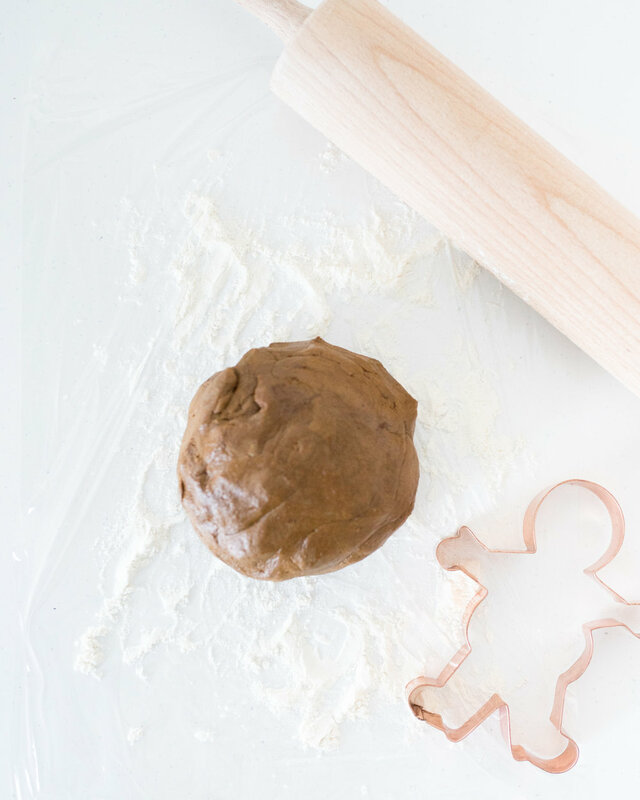 Roll out your first half of dough to a 1/8-inch thickness on a lightly floured work surface. 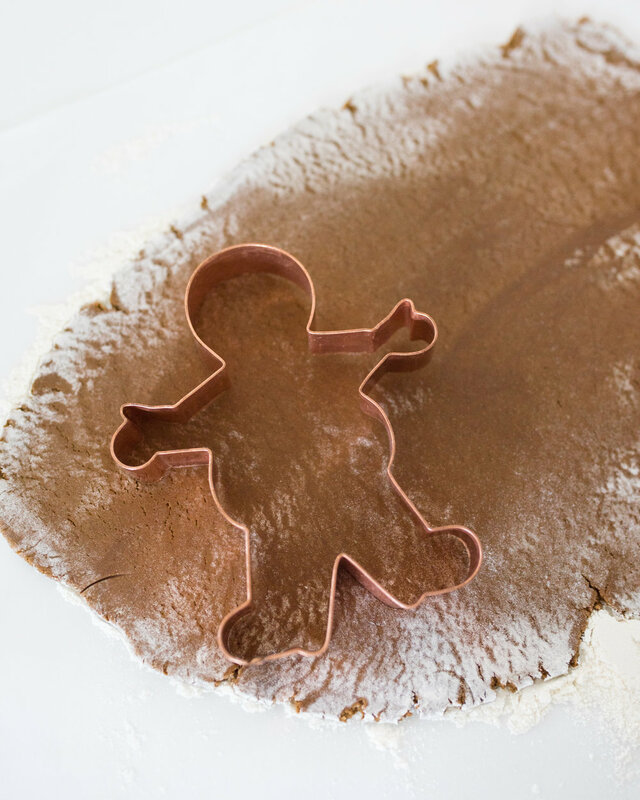 Begin to cut your gingerbread shapes with your chosen cookie cutter. I used a 5-inch gingerbread man cookie cutter and was able to get a dozen cookies. You can use any cookie cutter you prefer, just keep in mind if it is smaller to decrease your cooking time, likewise if the cookie is larger. Carefully lift your cut cookie shapes and place them 1 inch apart on lined baking sheets, then place in the freezer for 20 min. Repeat, with your second refrigerated piece of dough. Bake for 8 minutes or until the edges of the cookies start to brown. Let the cookies cool on the baking sheets for 1 to 2 minutes, then move them to a cooling rack. 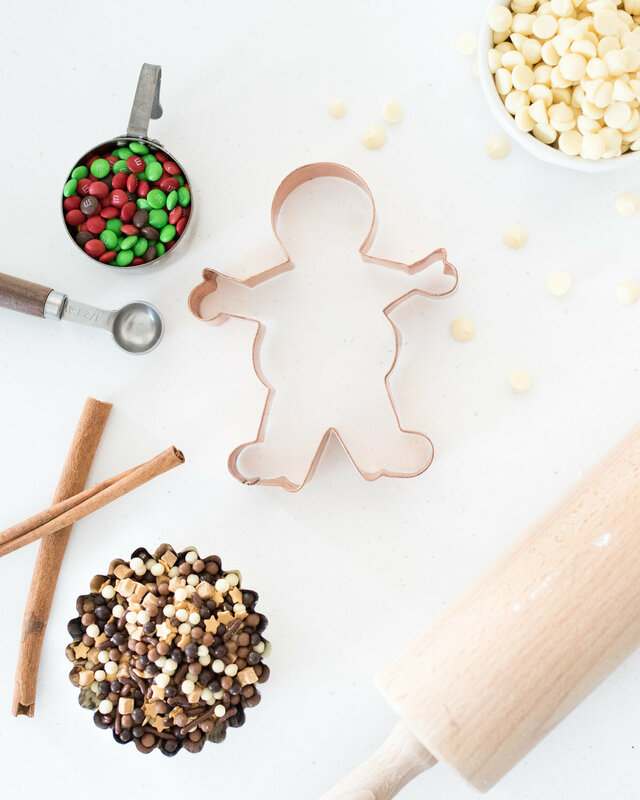 Once your cookies have completely cooled, you can begin to decorate! You can also store them in an airtight container for up to 5 days if you choose to decorate them another day-or have a super awesome cookie decorating party. I hope you enjoy this recipe as much as I do. If you have a gingerbread memory, I want to hear about it! Let me know in the comments below :). Roll out your first half of dough to a 1/8-inch thickness on a lightly floured work surface. Begin to cut your gingerbread shapes with your chosen cookie cutter. I used a 5-inch gingerbread man cookie cutter and was able to get a dozen cookies. You can use any cookie cutter you prefer, just keep in mind if it is smaller to decrease your cooking time, likewise if the cookie is larger. Carefully lift your cut cookie shapes and place them 1 inch apart on lined baking sheets, then place in the freezer for 20 min. Repeat, with your second refrigerated piece of dough. It’s that time of year where all the sparkles, trinkets, and pretty papers come out to play! I was so excited to put together this DIY…it’s only been on my to do list for the last 3 holiday seasons LOL. I remember making these in elementary school and it being so much fun…They didn’t make it home, of course popping them was way more fun. This time around, however, I thought I would go fancier than the usual and use funkier tissue paper designs and wrap. 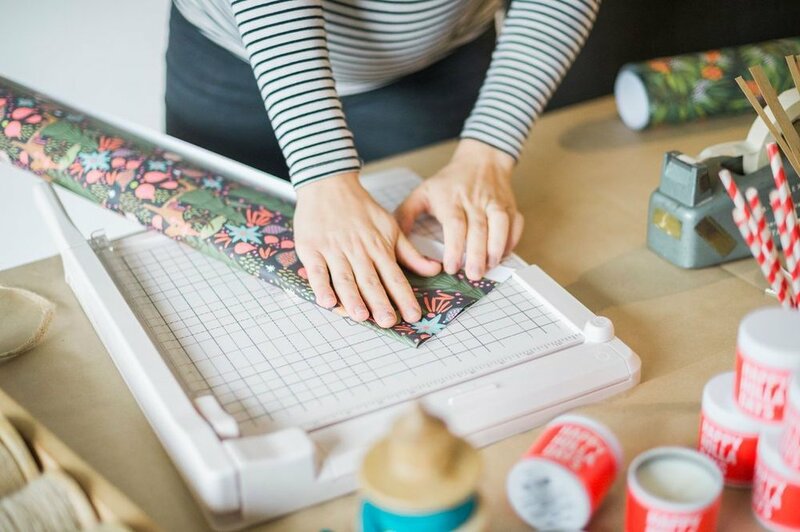 My forever favourite is Rifle Paper Co. anything or Abbie Paulhus Illustrations. But there are so many cute wraps out there to choose from, so go nuts! 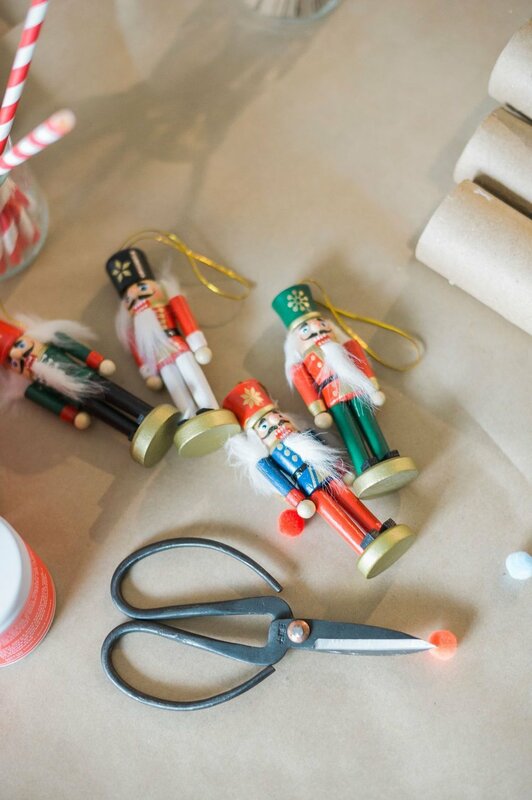 I found these cute nutcracker ornaments at Michaels! Insert your cracker snap centred in the toilet paper tube. Tape one end down to the tube from the inside. This will hold it in place when you go to grab the ends later to pop the cracker. Next, add your treats inside. 2. Roll the tissue paper over the tube and tape it to hold it in place. The ends at this point will be much longer than needed. However, wait to trim them to a later step. 3. Cut your wrapping paper to the width and length of your toilet paper tube. Leave your self about an inch in extra length to work with. Then, wrap it around the tube and tape in place. 4. 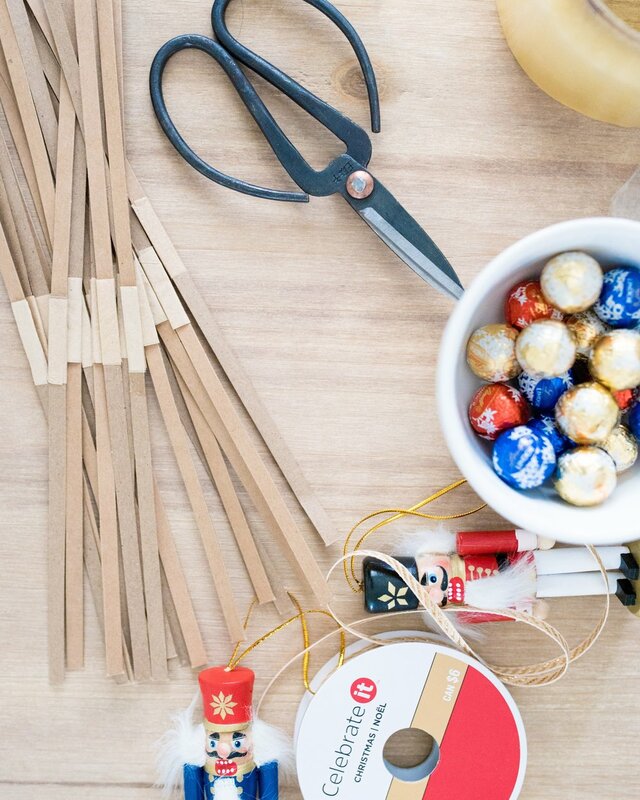 Next, tie a couple pieces of ribbon around the ends of your crackers and trim the excess off the ends. 5. Now the fun begins. Feel free at this point to add additional decorations to your crackers like pipe cleaners, pom poms, sparkles, stickers, etc. I added pom poms to the ends of mine using a glue gun. Others I just left as bows. Let me know your thoughts below! If you make some of your own crackers, be sure to show me by using the tag #ohsomonaDIY. I can’t wait to see! Happy Crafting! Boy oh boy was this a long-awaited post or what?! I feel like I’ve been in kitchen reno mode for ages! But like most renovations, delays are always expected at some point or another. However, it was all totally worth it. Using our kitchen now, I almost can’t even remember what our old kitchen ever looked like! ….Who am I kidding? 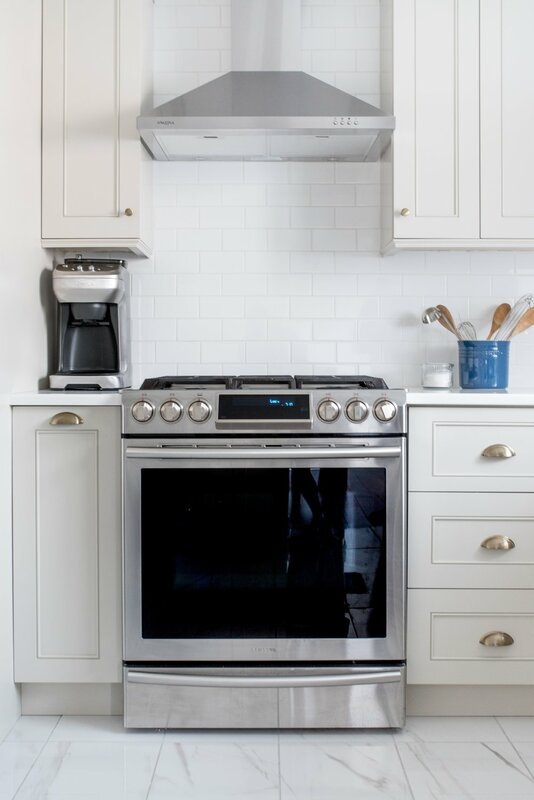 Who can ever forget that orange range hood? This kitchen had two good things going for it, its linoleum floors and its teeny tiny fridge. Just kidding! For real though, this kitchen had killer space and an awesome layout. Even though it was hard to tell before, I think we have really maximized it’s potential now. (P.S. don’t let the picture fool you, I was taller than that fridge, and I am not tall LOL). We started by gutting the kitchen. We removed everything including the bulkhead that ran along the top. This part was kind of scary, we really had no idea if we were going to open the bulkhead only to find that we could not remove it. Luckily, the renovation gods were looking down on us. All we needed was to reroute one small pipe and that was it! At this time, we also cut out a window into the dining room to open up the kitchen more. Next, we patched up the walls and added drywall where needed. At this time we added some additional outlets and lighting. As you can tell the lighting previously was very minimal, so we added 4 recessed lights in addition to the hanging pendant light. We found this awesome all-in-one recessed light set at Costco that are both budget-friendly and nice to look at. Our next step is where it started to get exciting. Mudding, sanding and priming the walls to get ready for installation! We purchased our flooring from Plaza Ontario in Windsor, ON. Kim was awesome in helping us to find the perfect tile for the space we had. We decided to lay the tiles in a straight lay pattern so we could avoid making the space feel super busy. We ended up going with a thick rather than thin grout line to help pull the grey out of the tiles a little bit more. Then the fun really began. Our cabinetry built by Darius Ghib and designed by myself and Mike was the icing on the cake. We really wanted a kitchen that was modern but yet still traditional and timeless. I kept saying to myself “will we love this in 10 years time?” and the answer I believe will always remain, yes. As you can tell, we didn’t waste time getting things back into the cupboards. I was more than ready to be back to an organized chaos LOL. When we first decided we would be doing a kitchen renovation, I started to really focus on my time in the kitchen and my uses for it. Like, what am I using the most? Or how far do I want to have to walk for something? I know it sounds lazy but it’s really just all about efficiency to me. I think coming from a restaurant background and having a husband in manufacturing makes efficiency top priority in our house . Also, what small appliances do I want out and what do I want to make room to hide? We aimed to make this kitchen as clutter-free as possible so that we would have lots of room for baking and food prep. See that humongous package of plastic wrap? Hiding that thing while still having quick access to it was one of my major kitchen goals LOL….Spoiler alert, we succeeded . We made the top drawer next to the oven deep enough to hold it. It’s the perfect spot! Anytime we need to use it, we just slide open the drawer and pull what we need. Not having to take it out of the drawer-BIG BONUS. Hey, it’s the little things right?! I’ll go more in-depth into what else we did space saving and organizational-wise further into this post. After installing the cabinetry, we installed our countertop and backsplash. We had such a big dilemma with our countertops! Did we want quartz or granite? Both our hearts wanted quartz, and white to be specific. We love the solid/non-busy patterns available with quartz but was nervous about is durability. We heard so many mixed reviews about quartz and white tops in general. Some said it will stain so easily and other said it withstands stains no matter what because it is not as porous as granite. We ended up just taking the plunge and going with this Stellar White Quartz countertop from Universal Granite and Marble and I’m so glad we did! So far, the upkeep on it has been great. It was so funny because when we first installed it, the big rule between myself and Mike was NO POMEGRANATES! Lol, have you seen that video? If not you can watch it here and you will know what I mean . But over time we realized that you do not need to cut pomegranates out of your life. As long as any mess is cleaned up quickly, no stains are left. We are careful not to leave anything on the counters that could leak and we don’t put hot pots on the counters either. We were told it can discolour the white in the counter…sorry, I didn’t want to test this theory out . But like I said, absolutely no regrets! So if you want white counter tops, YOU GET white counter tops!! If you’re going to take anything away from this post, it would be that. Okay, I’ve talked enough. Time to show you the reveal! We purchased the spindles for the sides of the sink from Millers Hardware in Windsor Ontario. So remember the empty space in the previous kitchen? Below the pendant, there used to be a small kitchen table. This is also where we cut the window so you could see into the dining room. To replace the old area, we added more counter/cabinet space. We are really into baking so we designated this counter to the baking counter. My mixer finally has a permanent home and it makes me sooo happy . This tap from Wayfair is just golden. I would just like to add that so far I’ve managed to keep these plants alive for a month, so… gold star for me! Okay, now let us jump into the little quirks of the kitchen. Have you seen the hidden microwave? Or perhaps you would like some tea? Still working on my tea selection…I feel now I can only buy the tea with super pretty packaging , but I’m working on it lol. I picked up this sleek and clean cutlery tray from Ikea and I just love it. These containers from Williams Food Equipment are a necessity to the baking counter. I have one in each drawer holding my flour, sugar, rice, and more flour lol. I love being able to just open the drawer and scoop what I need. Is it a thing to be addicted to storage containers? These OXO Containers also from Williams Food Equipment just make everything look ahhhhmazing. Just showing some love for this gorgeous piece from The Cross. I searched forever for a kitchen rug and never quite found what I was looking for until I saw this one. And Last but not least, we were aiming for a clutter-free counter, so anything we could put in the drawers was a key. I found these knife block inserts on Amazon. They were so inexpensive and a great addition to our storage solutions. And that’s it! I hope you guys enjoyed reading about our kitchen reno process :). I would love to hear your thoughts! If you have any crazy reno stories..I want to know! Stay up to date on the next home reno project by subscribing to my mailing list! Happy Friday!! I hope you've had a great week so far. I'm not sure about you guys, but I'm seriously looking forward to the weekend! We have plans to finish up some small projects around the house that I just can't wait for. What are your weekend plans?-and if you say lounging around in PJ's all day....I'm super jealous!! But if that is the case, and you’re feeling you want to take on a DIY, I got you covered ;). I have been working on perfecting this DIY Citrus Bath Bomb recipe for longer than I would like to admit.. LOL. But the good news is it's finally perfect! I'm a huge addict to the Lush Bath Bombs and love how they are 1) Super Fizzy, and 2) Usually have a small surprise inside. I've made bath bombs in the past and although they were super moisturizing and smelled great, they never fizzed as much as I would have liked. So now, it's recipe 2.0 (really like recipe 3241234242). I replaced the usual moisturizing ingredient in bath bombs of castor oil with coconut oil. I find it to be much more moisturizing, however, you can use any type of oil you see fit! Ex. Avocado Oil, Almond Oil, etc. For this recipe, I used this Young Living Grapefruit Essential Oil as well as some Dehydrated Lemons for decoration. To Dehydrate the lemons, I placed thinly sliced lemons on a baking sheet with parchment paper at 170 degrees for two hours then flipped them over and baked for another 2 hours. If you don't wish to have a citrus bath bomb, totally feel free to swap out your essential oil scents! I'm thinking the next batch I make myself will actually be a Jasmine scent. To get the round bath bomb shape, I used clear plastic Christmas ornaments. However, you could really use any type of mold you would like! Below you will find the recipe for these super cute DIY Citrus Bath Bombs! PS: If you wanted to gift your bath bombs, Take a small square of parchment paper and wrap it around the bath bomb. Then, take some twine or whichever string you prefer and wrap it around like you would a gift. I like using parchment paper because it can withstand oil stains from the bath bomb vs. kraft paper. Mix together epson salt, baking soda, citric acid, and cornstarch in a large bowl. Slowly add the coconut oil, essential oil, and food colouring to the dry mixture. This has to be done slowly so the baking soda does not start to bubble. Once the above is mixed, slowly add your water. Add small amounts at a time, mixing with your hands during the breaks. The mixture is ready once you can form it without it falling apart. Once mixed, add the ingredients to your bath bomb forms. For these bath bombs, I used clear plastic Christmas ornaments but you can really use anything you would like! Let dry overnight. Once dry, you can remove them from their forms and use however you would like :). I individually wrapped these for gifts by taking a small square of parchment paper and tying together with twine. -You can use any food colouring colour you wish. For this recipe, I used 5 drops of red food colouring. You can add more or less just depending on how intense you would like the colour. -Be sure to add wet ingredients slowly to prevent activating the baking soda. However, do not be alarmed with some minor fizzing! Happy Tuesday everyone! I hope your week is off to a good start :). I’ve been trying something new this week where I go to sleep early and wake up super early to attempt to add more hours to my day… Let’s just say, my energy level right now feels like it should be Friday already… and its not LOL. On the plus side, this easy chickpea curry has been my new best friend in the kitchen. It’s quick and simple to make and the recipe can be altered in so many different ways. It also tastes great (if not better) the next day after the flavours have marinated. So making lots and keeping it for left overs is okay in my books! *Tip- pre measure all of your spices in a small cup. This way its quicker to add them into the pot in one shot. *If you want to be a little bad and add some richness to the curry, at the very end once the curry is done cooking, add a tablespoon of butter and stir it in until it has dissolved. I’ve repeated this recipe and instructions at the end as well, incase you wanted to skip the pictures and head right to the nitty gritty. Preheat your oven to 375 degrees. Start by breaking apart the head of cauliflower into bite size pieces and spreading them across a baking sheet. Add a drizzle of avocado oil over the cauliflower, and lightly sprinkle salt and pepper. Place in the oven and let roast for 15 min or until golden brown. In a large pot on medium heat, add the oil and diced onions and sauté until almost translucent. Add your mushrooms, garlic, and spices and stir. To prevent the spices from sticking, do not be shy to add a table spoon of water as you go. Once everything is combined, add your vegetable or chicken stock, small diced potatoes, diced tomatoes, chickpeas, and cauliflower to the pot. Let it boil for 5 min, then turn down to simmer. Let simmer for 20 min or until potatoes and chickpeas are very soft. Once finished, if you would like to thicken the curry, remove from the heat and add 1 tablespoon of cornstarch (dissolved in cold water) to your pot. Thats it! You can eat this curry on its own in a bowl or served over rice or quinoa. Feel free to add or take away vegetables to the recipe as well! It’s super versatile. Thats it! I put together this recipe because Mike and I have been looking for more meatless meal options to try and cut down on the amount of meat we eat. However, if you are feeling like chicken or beef, just add some pre cooked in the simmer stage of the recipe. Preheat your oven to 375 degrees. Start by breaking apart the head of cauliflower into bite-size pieces and spreading them across a baking sheet. Add a drizzle of avocado oil over the cauliflower, and lightly sprinkle salt and pepper. Place in the oven and let roast for 15 min or until golden brown. In a large pot on medium heat, add the oil and diced onions and sauté until almost translucent. Add your mushrooms, garlic, and spices and stir. To prevent the spices from sticking, do not be shy to add a tablespoon of water as you go. Let simmer for 20 min or until potatoes and chickpeas are very soft. Once finished, if you would like to thicken the curry, remove from the heat and add 1 tablespoon of cornstarch (dissolved in cold water) to your pot. That's it! You can eat this curry on its own in a bowl or serve over rice or quinoa. Feel free to add or take away vegetables to the recipe as well! It’s super versatile. *Tip- pre-measure all of your spices in a small cup. This way it's quicker to add them to the pot in one shot. Pre-measure all of your spices in a small cup. This way it's quicker to add them into the pot in one shot. If you want to be a little bad and add some richness to the curry, at the very end once the curry is done cooking, add a tablespoon of butter and stir it in until it has dissolved. I hope your week is off to a good start. I have a long to do list of work around the house we need to do this week, but so far I’ve just said “lets start tomorrow” haha. So wish me luck that today, I get this week moving! Haha. So I have made a pact with myself to slowly start to get back into the grind of exercising and eating healthy, but boy its been tough! I can almost always fit a nice walk in the day, but eating healthy or even eating a decent meal at all has been hard. I find that sometimes the days just go by so fast that by the end of them, I realize I just snacked all day…. and usually not the healthy snacks either. (Any Mama’s with me on this one?!? LOL) . Yesterday I decided enough is enough and I’m going to make sure I am getting in some healthy meals throughout the day. So I broke out the QUINOA. What I love about quinoa is it just seems to absorb the flavour of whatever your eating, and bonus, it’s packed with tons of protein. I made a huge batch, this way I can store it in the fridge for the week. If I have easy access to it, and I don’t always have to put a pot on to cook it, I’m hoping it encourages me to eat the healthier option more. Any who, I went through the fridge and threw together a bunch of things I had. Boy oh boy did this turn out good. It was so quick to make! The quinoa takes 15 min to cook, but if you have that done ahead of time, this recipe should only take you about ten min to prepare and cook! Start by sautéing the onions and garlic on medium heat with olive oil. Once your onions are almost fully translucent, add the mushrooms. Cook until the mushrooms have become a nice golden brown. You can then add your corn, shrimp, and salsa, as well as your spices. I used about 2 teaspoons of Sriracha with my dish but you can use any amount you think fit for your taste. Cook on medium heat until your shrimp has fully cooked. It should be pink in colour, but if your like me and are still unsure, cut into a piece of shrimp to check that it is no longer translucent. I am always over cooking my shrimp because I’m a worry wart that I’m going to serve it raw haha. That’s it! I sliced some avocado to garnish my dish. I highly recommend doing so as well. It really complimented the spice of the dish nicely…. AND who doesn’t like avocado?!?! Except my husband lol. More for me! Okay I am super excited to be sharing this post with you guys. For one it’s the first post since having baby Amel (insert heart eyes here :p ) , but also because this challenge hasn’t come at a more perfect time to help this Mama’s skin. Since I know a number of lovely ladies who either just had their precious ones or are about to… I figured I’m not the only one who’s going to benefit with this challenge. Not to mention many others I’m sure. So I guess you could say I’m sharing some pretty golden information over here (okay now lets insert the super cool sunglasses emoji). Seanna from Elodie Beauty has teamed up with ShopEco to bring you an awesome skincare challenge to get your skin glowing and in gear for summer. So if your like me right now and your skin is just not cooperating, or it simply just needs that little boost in TLC for summer, Sign up here to take part in the 10 Day Challenge. The challenge is designed to reboot your skincare routine and get you on the path to healthy radiant skin. Private Facebook group to discuss questions and offer support to the challenge participants. learn all about “skin saboteurs” – those products, habits, lifestyle that affect the quality of your skin and prevent you from having a healthy, glowing complexion! I am so excited to be taking part in this challenge. I think its going to be a great motivator to finally get a handle on my skin care routine. Also, it’s going to be great to get the one on one time with Seanna to go over my concerns… because god knows how many times I’ve turned to google and I got about 300 different answers to my questions. Can’t wait to get started! I will keep you guys posted along the way Let me know if your joining the 10 day challenge too! Mona Elkadri is a Lifestyle Blogger with a fondness for everyday living & entertaining. From sweet recipes to home decor & DIY, and everything in between.